Christmas is two weeks away and everyone in Crystal Cove, California is looking forward to the upcoming Christmas festival. Jenna Hart is getting ready for the mass of shoppers who will be coming to the Cookbook Nook, the culinary bookstore she owns with her aunt. Jenna’s family has a long-time friendship with the elderly millionaire Jake Chapman. When someone close to Jake is murdered, Jenna launches her own investigation to make sure Jake isn’t accused of the crime and more importantly to keep him from becoming the next victim! This is the seventh book in this series, but it has enough background information for new readers to enjoy it and enough fresh developments to keep it interesting for longtime fans. I always enjoy the references to a variety of cookbooks and as expected, this book includes plenty of shout-outs to actual cookbooks and holiday-themed mysteries as Jenna sets up displays and assists customers in the Cookbook Nook. Jenna is a charming heroine whose business sense and loyalty to her friends and family is admirable. She is cautious in her love life, but I like the way her relationship with her boyfriend Rhett has slowly developed. I also really enjoyed getting to know Jenna’s niece, Lacy. Lacy is smart and independent. She seems flippant at first, but is genuinely sympathetic to others and is able to help with some parts of the investigation. I like seeing Lacy’s relationship with her aunt grow as she helps Jenna and Jenna helps her prepare for the teenager’s upcoming singing competition. 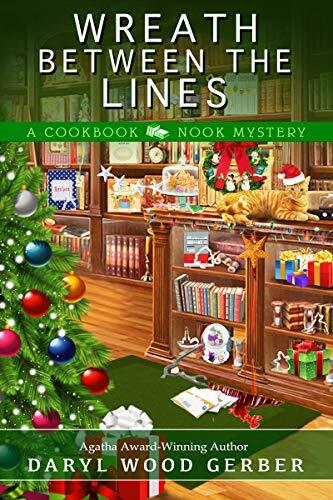 There are a lot of Christmas cozies out this time of year, but Wreath Between the Lines has the perfect mix of holiday festivities and sleuthing. The story gets the reader excited for the upcoming holidays without sacrificing the pacing of the main plot. There are many credible suspects for the murder, and Jenna doesn’t hesitate to question them all, even getting the grudging cooperation of the police chief Cinnamon Pritchett. Cinnamon has been hard to take in some of the earlier books, but she has mellowed over time which makes her easier to like. With the clues the author gives, readers may be able to guess the murderer, but will be surprised by the complex motive. The book has a sweet, uplifting ending, perfect for a Christmas-themed cozy mystery.